An ambulance leaves from a Stoney Point residence for Norwalk Hospital with a person who was pulled from the Saugatuck River after jumping from the I-95 bridge on Monday February 19, 2018 in Westport Conn.
WESTPORT — A man was pulled from the cold waters of the Saugatuck River Monday and transported to Norwalk Hospital after he reportedly jumped from the Interstate 95 overpass. On a rainy President’s Day around 4p.m., Westporter firefighters were dispatched on report of a person in the Saugatuck River near the I-95 overpass. Westport fire, police, and EMS arrived at the scene and confirmed one victim was in the water. “He parked his car on I-95 and jumped,” said Westport Police Chief Foti Koskinas, who was at the scene Monday afternoon. The outgoing current pulled the man down the river, Koskinas said, adding the victim sustained injuries. Two firefighters put on cold water suits and entered the water in an attempt to rescue the victim, but the victim traveled approximately 500 yards due to the current from where he first jumped, according to a statment from the Westport Fire Department. The firefighters swam to the victim and secured him while a firefighter on shore pulled the victim to land near the area of Stony Point Road, around 4:20 p.m, Assistant Fire Chief Brian Meadows said. 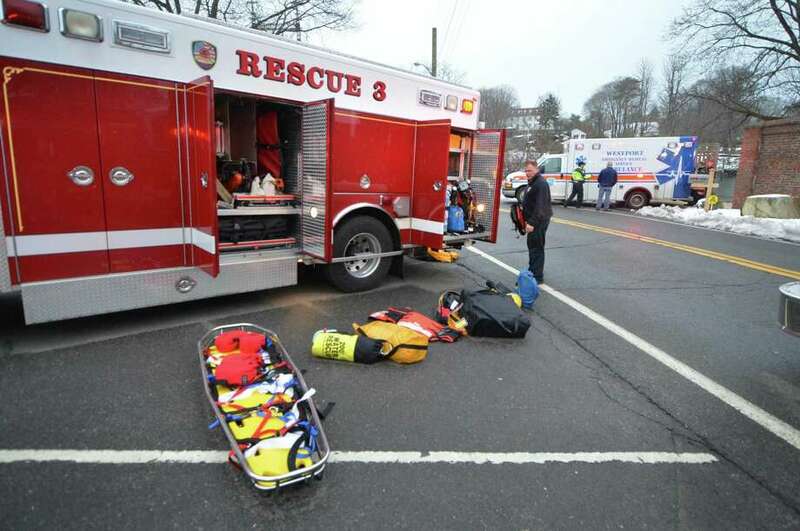 Two firefighters assisted Westport Emergency Medical Services in transporting the victim to Norwalk Hospital. Koskinas said it is unknown why the man jumped and his car, which he left on the highway, would need to be searched. Connecticut State Police are in charge of the case given the incident’s location on a state highway. Traffic on I-95 was slowed due to the police activity and train traffic was temporarily halted when the search was underway. As there is no criminal aspect to the case, no more information will be released, said Sgt. Eric Haglund, a State Police spokesman.